Vaccinations records can be brought in with pets or faxed from your veterinarian or another Preppy Pet. Pets are required to have all current vaccinations at least 48 hours before arrival. Bordetella (Canine Cough) Please check your paperwork as this is a requested vaccine. Given at least 3 to 7 days prior to arrival. Canine influenza H3N2 Vaccine is highly recommended 3 weeks prior. Pet Items we suggest to bring. Food and medicine. Optional – toys, treats, and bedding. We do not limit your pet items except no leashes, however we try very hard to return all of your unused items, but we are not responsible for any personal items lost or damaged. We recommend allowing one hour after returning home to offer your dog food and water. This may prevent vomiting that may occur from excitement of playing during the day, only give small amounts at a time. If your dogs bowel movements are loose, boil some chicken and rice as it may help. After playing during the day, your pet will sleep a lot which is normal. New dogs that play may have more sensitive paw pads until they get tougher. Dry hack coughing from your dog within 2-3 days of returning home may mean that he has canine cough, a contagious condition to dogs, but not people which is similar to the common cold. Preppy Pet require all pets to be vaccinated, however it is not 100%, therefore a pet can still get any virus. Preppy Pet will not be held responsible for any illnesses. What services does Preppy Pet provide and can you explain? Unlimited Overnight boarding in a fun, safe, clean, climate controlled environment for Dogs, Cats, Birds and Small Animals with weekends being the busiest. Private suites for daily naps, feeding and night times. Doggie Daycare is most popular weekdays. We offer Spa bath treatments to most dogs so they will go home looking and smelling great after playing. Services many differ with franchisee locations such as 24 hour care, full grooming,and training. How is Preppy Pet different from other boarding kennels for my Pet? How is Preppy Pet different from other pet care providers such as my veterinarian? Many veterinarians do some boarding, most very limited with size and weight restrictions, and offer no play options. Some have no climate controlled facility, only small cages and maybe two walks. You do not stay at a hospital when you go out of town, why should your pet? Preppy Pet states that they are not a one price, one size fits all type pet care facility, what do you mean? Most pet care providers do not care if you have a 3 lb Chihuahua or a 150 lb Great Dane, they do not care if your dog is an active 2 year old or a 12 year old with arthritis. 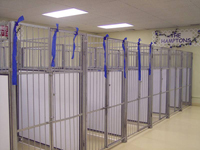 They normally charge just one price with play included and they have one size kennel enclosure. Preppy Pet charges by the suite size and we have 5 sizes to fit your pet and the size of your pet family. You will receive 50% off your second, third and fourth pets sharing the same suite! By letting us customize your stay you will not only get what you want and your pet needs, but you will save money every time with us. Why do some kennels restrict us from seeing in the back where the dog stays? They may have several reasons why, however we are proud of our facilities and want you to take our Smell and Tell Tour. We do not have large fancy reception lobbies as we believe it is more important to see where your pet will stay, sleep and play. You are even welcome to place their toys, treats, bed and bowls in their suite. Why such big differences in local kennels we visited, where the dog sleeps in enclosed boxes with solid doors, like closets? Some even offer no cages with home type furniture, Why? Our custom built large suites are all open view front and tops for your pet with privacy sides. The largest single cost to a boarding facility is the animal enclosures. Without having the animal enclosures also known as suites, rooms, villas, cabins or kennel runs, basically it is an empty building. To provide the best care, dogs must be separated while eating, napping and sleeping. ABKA Owners Bill of Rights states, “We will provide individual sleeping areas for boarding pets.” Preppy Pet has been a member in good standing since 2003 and always meets or exceeds the ABKA standards. To do this correctly, it is a major expense and some boarding facilities cut corners so they build something to contain the pets. Some out of wood and other home type building products then add furniture that may holds germs, viruses that can not be cleaned effectively. They usually have solid type doors in which can be very stressful on your pet if they can not see out. Please do not pay to put your dog in a box, closet or take a chance sleeping in a pack! Some kennels smell bad! Why does Preppy Pet smell so good? Preppy Pet only uses animal friendly cleaners, along with air purification systems, and our kennel suites do not hold germs and viruses that cause odors. Take our Smell and Tell Tour to learn more. Why are Preppy Pet rates lower than other upscale pet boarding providers? We work hard to open our franchises effectively, train our Franchisees to manage efficiently, and provide the best pet care possible for the best price. Will I get the same type service at any Preppy Pet located nationwide? Yes, the benefit to a franchise is consistency. So you can expect the same loving, caring services, options for you and your pets, although prices may vary with locations and some due to additional services that may be offered such as 24 hour true-care with some cage less options, airport lobby extended convenience hours and more. Do you provide any other services such as grooming, training and adoptions? Yes, we do offer full grooming and obedience training at select locations nationwide. With our adoption program we place pets with loving families, assist adoption agencies as well as sponsoring adoption days. Check with your local Preppy Pet for services offered and adoption day schedules. What is the difference between Indoor play and Daycare? Daycare dogs play in same areas but check-out before closing each day. Indoor play, Stay the Preppy Pet way with Indoor play is an option for our boarding guests. Our climate controlled indoor play areas are separated for toys, small, medium and large breeds. Our preppy theme play areas are named country clubs, yacht clubs and racquetball clubs. How many outside walks will my dog receive and why do some competitors have no outside walks areas? Dogs will receive a minimum of five outdoor walks daily. All Preppy Pet locations have secure outside walk areas as some dogs will not want to go potty inside. Outside walking areas are needed, but they are difficult due to local zoning regulations and do require to be maintained, therefore many pet care providers including some large chain pet stores with a pet motel do not have outside walks. What are the reception lobby Hours for checking in and out? Individual location hours may vary, however, each location is open every day of the week except the following major holidays: Thanksgiving, Christmas, New Years Day, Easter, Memorial Day, 4th July and Labor Day. Will I receive a discount for multiple dogs and extended stays? Yes, you will receive (50%) 1/2 off for additional same family pets sharing the same suite. You will also receive long term daycare and boarding discounts, Check with your local Preppy Pet. Some places will not accept our pet for overnight boarding unless we are in enrolled in daycare with them. Will you? Yes, we are aware of some restrictions from other national franchises. We will be honored for your pets to be our guests with or without using our daycare. We welcome all size dogs! We do not accept any aggressive pets that may injure themselves, our guests or staff. If you let us know about what temperament your pet may have, we will advise. They may be accepted, however might have limited or no group play options. We will accept Pit Bull a.k.a American Staffordshire Terrier, a Staffordshire Bull Terrier, unless the local government or state mandates the breeds we may accept. Male Pit Bulls over the age of 1 year must be Neutered. We do offer private play only. We do not accept any dog in heat, major health issues or fleas/ticks problems. We may not accept any pet based on the discretion of the Franchisee or Managers decision. Can you provide special dietary needs and medications for my pet? Yes, please provide all foods and medications with instructions and our trained and caring staff will make sure they receive it timely. What type of security does Preppy Pet provide and how about if there is an emergency with my pet? We provide security monitoring. We also have local veterinarians on call, as well as emergency after hours medical centers. We will contact you or your emergency contact number immediately. Most Preppy Pet do not staff 24 hours. In our years of experience with thousands of boarding nights, we find that our pets sleep better throughout the night without being disturbed . Most dogs play hard daily and sleep very well at night. If a staff member enters the suite areas and causes one dog to bark, it leads to the rest barking and disturbs sleep time. This is the first time boarding my preppy pet, what should I bring, any deposits required, how do I reserve, and what vaccinations required? You may call your nearest Preppy Pet or reserve online. No deposits required and you will pay in full when you check-out. For extended stays of 2 weeks or more, you will be required to pay a deposit or have a credit card on file. 3 night minimum stay required for Thanksgiving and Christmas holidays. We also recommend keeping your pets on the same diets, so you may bring your food and treats, however we do provide premium foods at a small charge.